However, there are two types of life insurance policies that do not require a medical exam. They are Simplified Issue Life Insurance and Guaranteed Issue Life Insurance. In this article, we will explore the differences as well as pros and cons of each. A Simplified Issue Life Insurance Policy will be offered if your answers to certain questions fit the underwriting guidelines of the insurance company to which you are applying for coverage. There are typically four or more questions asked to get a quote on Simplified Issue Life Insurance1. Your answers will determine whether you are approved or not; as well as the cost of the policy (i.e. the premium). Do you currently reside in a hospital or long-term-care institution? Do you have AIDS or HIV? By answering “Yes” to smoking, you may still be able to get a Simplified Issue Life Insurance Policy but it will just be more expensive. If you answered “Yes” to any one of questions 2-4 you should probably try finding another route because the company won’t be offering you a policy (perhaps a guaranteed issue would suit your needs – read more below). However, if you answered “No” to questions 2-4, you can expect to be offered a policy. This is an example of the underwriting questions asked by most insurance companies. Some companies will ask a few more questions, and with some, the questions will be slightly different but by definition of the word “simplified” you will experience far fewer questions and invasive tests than the standard life insurance exam. Like a Simplified Issue Life Insurance Policy, a Guaranteed Issue Life Insurance Policy requires no medical exam. One major difference is that unlike simplified issue, there are also no medical questions to answer. As the name implies, if you pay the premium the company is “guaranteed” to issue you a policy2. The major drawback is that the full death benefit is not available until after the policy has been in force for a given amount of time, usually one to two years. In the insurance industry, this is called graded benefits. In some cases, if the insured person dies within 2-3 years of purchasing the policy, then the beneficiaries only get refunded the premiums paid up to that point. Some companies give a percentage of the death benefit, but the beneficiaries won’t get the full amount. Here’s a quick two minute video by Jeff Rose that gives you the bread-and-butter of the simplified versus guaranteed term issue life insurance comparison. Both Guaranteed Issue Life Insurance and Simplified Issue Life Insurance are usually considered by individuals who are between 45-85 years old and have health issues that make getting life insurance challenging. Always get a quote on life insurance. It costs nothing and can only inform you on making your decision. One good strategy would be to apply for Simplified Issue, since it is usually less expensive. Then, if you are denied then buy Guaranteed Issue. I suggest talking to a person on the phone or even in person when discussing any insurance policy you are considering. Life insurance policies can be very confusing and it will be easier to discuss the policy in person than through email. That way you get all of your questions answered and you understand all the terms before you sign on the dotted line and start paying the premium. If you have any questions about Guaranteed Issue or Simplified Issue Life Insurance, feel free to ask below in our comment section. We’ll do our best to help you better understand your options and which might be best for you. Sources: Frankle, Neil. “How To Save Big on Guaranteed Issue Life Insurance” MCMHA.org; Frankle, Neil. 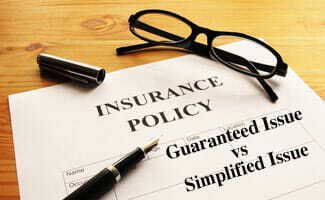 “Should You Buy Guaranteed Issue Life Insurance – A Surprising Answer” WealthPilgrim.com; “The Basics of Guaranteed Issue Life Insurance” Insure.com; Dudayev, Mack. “Guaranteed Issue Life Insurance aka No Questions Asked” Insurechance.com.